When my husband was sick in hospital for one day, a friend who is actually a colleague of my hubby but became my friend the day my hubby fell sick and she stayed with me throughout the morning in the hospital, bunking her office, to boost up my confidence. In a foreign land where you have hardly been a month, such things mean a lot. In the afternoon, when we both returned to the hotel, tired and famished, she served me one bowl of masoor dal. I must admit that it was the tastiest masoor dal I had in my life albeit not the healthiest. So weight watchers and health freaks, this dal is not meant for you, but if you can keep dieting aside for one day and indulge yourself a tasty meal comprising hot steamed rice served with this daal and some fries...Oooh ! Heaven. 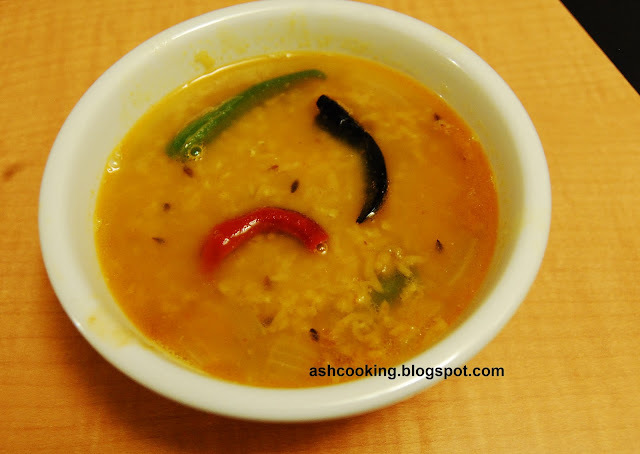 Ingredients: Cooking time: 30 minutes approx..
1) Wash masoor dal cleanly under running water. 2) Then in a bowl, put together masoor dal with a scoop of butter, turmeric powder, red chilli powder and salt. Pour water in 1:2 ratios. Microwave for around 15-20 minutes till dal is cooked through. You may use a pressure cooker also. In case of pressure-cooking wait till one whistle, on high flame, before turning the heat off. 3) Now in a wok, add ghee and when ghee turns hot, toss in the cumin seeds and dry red chillies and let them sputter. Then shallow fry the onions. Add cumin powder and sauté for a minute. 4) Pour the dal in. Add green chillies and sprinkle the garam masala powder on top. 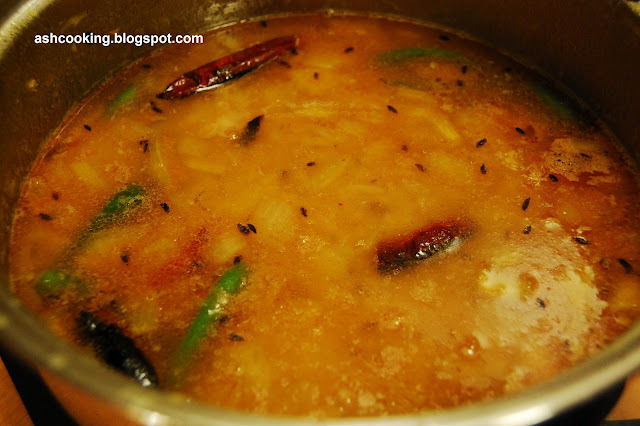 5) Let the dal simmer on low heat for 2 minutes before turning off the flame. This looks great. Will definately try it out today.